If there’s one way I like to take my veggies, it’s with cheese, please. 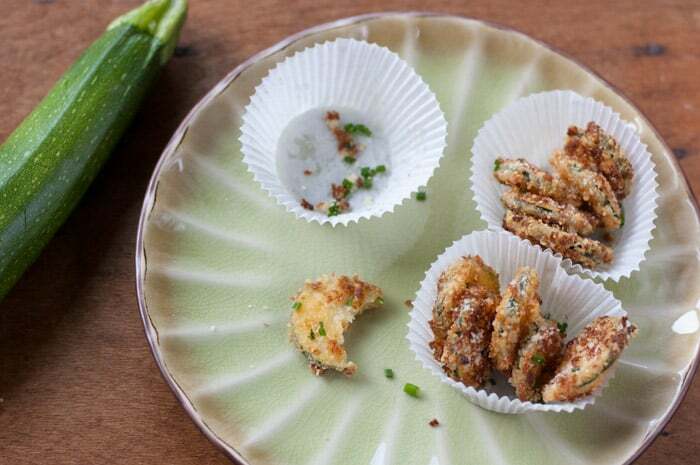 I also don’t like my fried zucchini with too much zucchini. Crazy Person Translation: I don’t want any thick pieces of mush to gnaw through. I mean, come on. I don’t want to know I’m eating veggies. I like to be tricked. That’s why I was interested in this recipe, because the pieces of zucchini are cut nice and thin (about 1/4 inch). 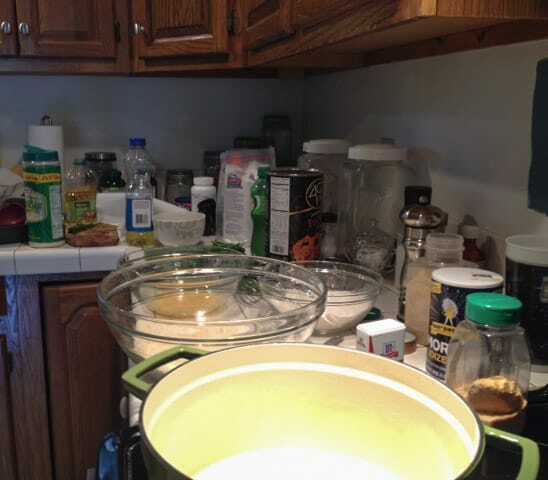 I have to admit that I had a bit of a…how shall I say…issue problem crazy fiasco getting the recipe just to my liking. They don’t call me The Kitchen Snob for nothin’, ya know. But some of the trouble had to do with getting my stove-top temp just right. A bomb went off in my kitchen but – yippie ki-yay – I came up with this recipe! I learned a little bit about using different oils, too. 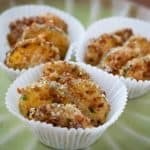 And how about putting them in cute little cups (preferably more decorative than these plain white ones) so guests can eat them easily. Golly, I’m so dang crafty sometimes that I’m sure Martha Stewart has got her eye on me as a fierce competitor. Use vegetable oil. I tried canola oil and it actually gave them a weird flavor. 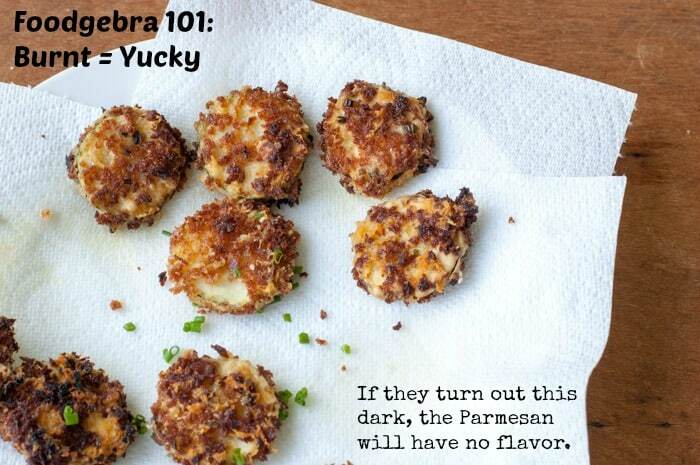 Only cook them until they are just light brown, any darker and the cheese will lose its flavor. Know your stove. The recipe called for medium-high heat. Knowing my electric stove and it’s single magic burner that runs hotter than any of the other burner on the planet, I started the heat on level 3 (which is about medium on my stove-top even though it goes up to 9!) and I used a cast iron Dutch oven instead of a skillet (the high sides helped keep oil spatter in check). Ooops – level 3 heat was too high. Burn failure! So I turned it down and alternated between 2.4 and 2.6 and that was the perfect temperature. Of course, using a cast iron dutch oven takes more time because it takes longer to heat up. But once it’s hot – oh it’s hot, baby! After dredging them in the flour, make sure you bang them against the side of the bowl to get off any excess flour. If you don’t, the egg won’t adhere to the zucchini very well. I can’t believe I’m going to say this and if you see me on the street I will completely deny this anti-snob remark but…I found that the Kraft Parmesan in the green can added a much better flavor to the zucchini than my expensive aged Parmesan I bought at the deli. Again, I will deny it. Who? What? See, told you. 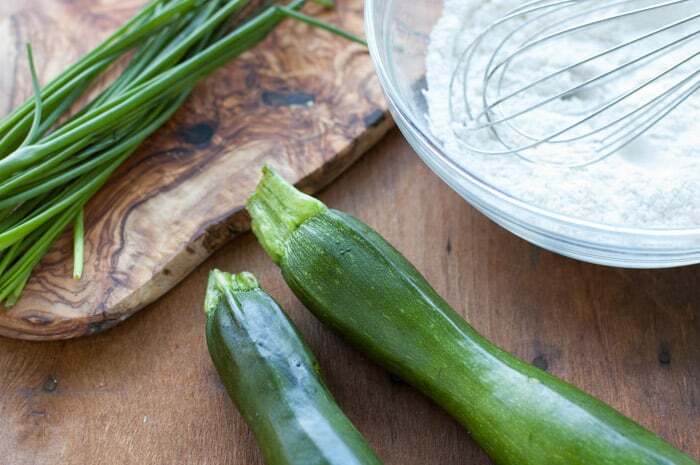 Make sure you bang the zucchini against the side of the bowl to shake off excess flour before putting them in the egg mixture. You could add any seasonings you like to the flour. For example, add some cayenne pepper to make them spicy if you’re crazy adventurous like that. Onward, cooking soldiers. 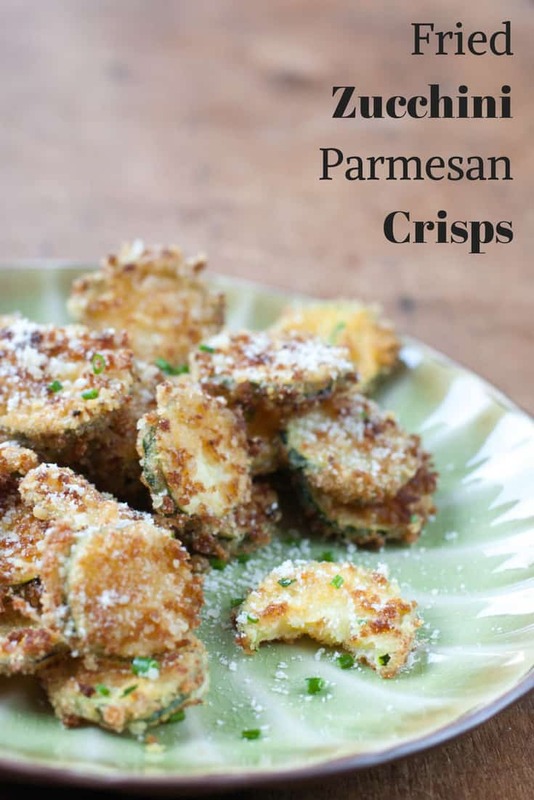 Make these zippy Zucchini Parmesan Crisps and report back to me. 2 zucchinis, thinly sliced rounds (about 1/4 inch thick). Leave skin on. Heat vegetable oil in a large nonstick skillet or Dutch oven over medium heat (careful – if your stove runs hot, medium may be too high). Cast iron will work well but watch the heat. In large bowl, combine Panko breadcrumbs and Parmesan, set aside. In small bowl, combine flour, salt, pepper, granulated garlic, and granulated onion, set aside. In small bowl, whisk eggs and set aside. Working in batches, dredge about 6 zucchini slices in flour. 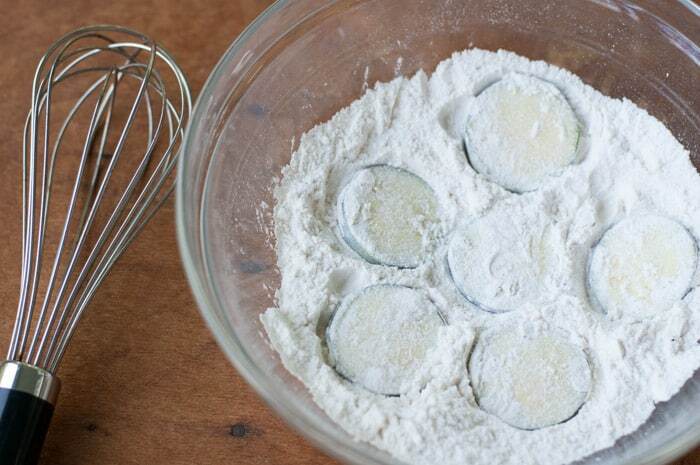 Shake off excess flour by banging the slices against the side of the bowl. Then drop them in the egg mixture and flip them over to coat both sides. 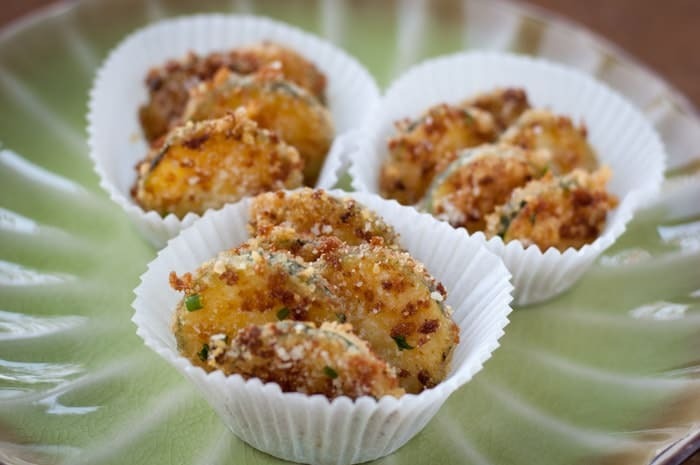 Then dredge the zucchini slices into Panko mixture and press them down with your finger to coat both sides. 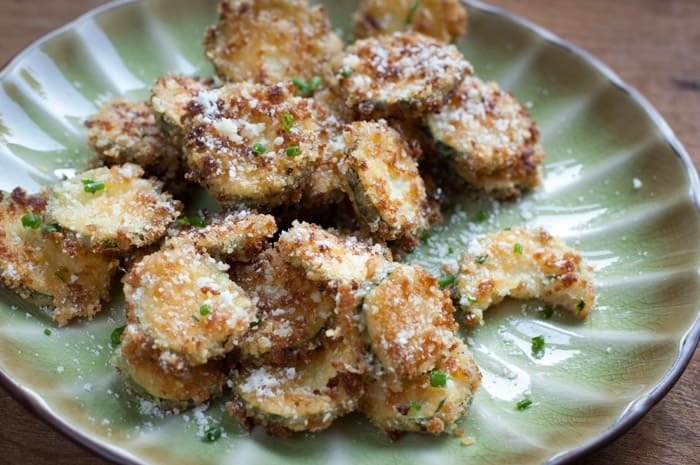 Add batch of zucchini to the skillet and cook until light golden brown and crispy (about 1 minute each side). If they get any darker than light golden brown the cheese loses its flavor. Transfer to paper towel-lined plate. While still hot, sprinkle generously with more Parmesan cheese. If you think you need more salt, now is a good time to add it, while they’re still hot. Sprinkle with chives or green onions (if using). 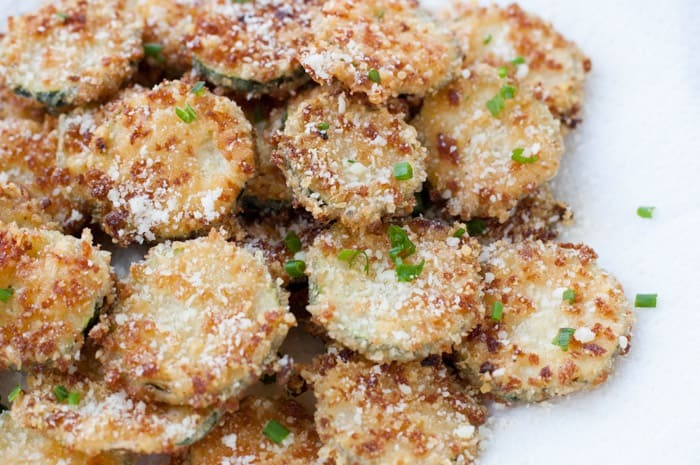 My mouth is watering… can you come to AZ and cook those for me please? Definitely – I would love to! and make them for me?